Intensive, highly practical boat building courses taught on Monmouth Beach in Lyme Regis. Courses range from 1 day to 38 week City & Guilds 2451 in Boatbuilding, Maintenance and Support. Some students have the opportunity to build a boat for themselves while on the long course. 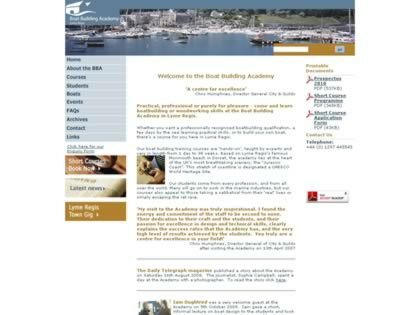 Web Site Snapshot: If available, above is a snapshot of the Boat Building Academy web site at http://www.boatbuildingacademy.com as it appeared when this site was added to the directory or last verified. Please Note that Boat Design Net has no involvement with the above web site; all content and images depicted in the above thumbnail are the property and copyright of Boat Building Academy unless otherwise noted on that site. Description: Intensive, highly practical boat building courses taught on Monmouth Beach in Lyme Regis. Courses range from 1 day to 38 week City & Guilds 2451 in Boatbuilding, Maintenance and Support. Some students have the opportunity to build a boat for themselves while on the long course.